Wall Mount Plastic Enclosures made from ABS Plastic. Wall Mount Plastic Enclosures and Project Boxes for Electronics. There are a wide range of plastic housings in this series of enclosures, these plastic enclosures offer options with and without mounting tabs as well as deep bottom options. Some models include battery access. We also offer screw free boxes that can be glued together for a permanent closure. These small project boxes also has provisions for mounting your circuit boards making them suitable for many types of electronic devices. It also includes 4X4 plastic cases designed to fit over a standard metal EMT electrical box. All of our ABS enclosures are made from high quality plastic and are RoHs and Reach compliant. ABS Wall Mount Plastic Enclosures and Project Boxes. These ABS IP65 plastic enclosures are molded using ABS plastic and are RoHs compliant. These wall mount plastic enclosures feature a flat bottom cover and molded top cover. Most are available with or without external mounting tabs. A few are available with battery access. They feature wall mount tabs, perfect for projects any where mounting to a surface is needed. Some of them can also be used as a small handheld enclosure. EMI/RFI Shielding is available for all our enclosures. Please call for pricing. These plastic utility boxes can be machined to meet your needs. Custom Machining and Printing is available. Please call for more information. 4 Outlet Wall Mount Plastic Enclosures for Electronics Projects. These IP65 enclosures are Reach compliant. These new SATURN Plastic Utility Cases have an added benefit that is conducive to many electrical applications. This plastic enclosure measures 4.38" x 4.38" and are just the right size to install directly over a standard 4 outlet electrical box or outlet. For a wall application it can be installed using the optional wall mounting tabs. Or, they can be installed directly over a standard 4 outlet electrical box by drilling through the PC Board screw bosses. 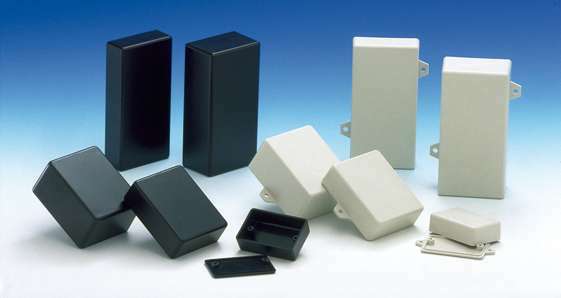 These unique cases are suitable for a variety of plastic housing requirements from wall mounted to electrical applications. They feature a plastic molded top cover in three different heights and a flat plastic molded bottom. PC board mounting bosses are molded-in in all models. The boxes assemble easily using the four Plastite screws that are included. These housings are made from high quality ABS plastic. 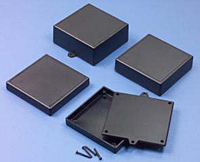 ABS Plastic Potting Boxes for Electronics and Projects. The 075X22 and 100X22 ABS plastic potting boxes features a molded top and bottom that fit together snugly, eliminating the need for screws. If needed, the top and bottom can be glued together for permanent closure. The two halves can also be separated and used as potting boxes. The 111X14 enclosure is a two piece design that snaps together for easy access. PC board mounting bosses are located in both halves. 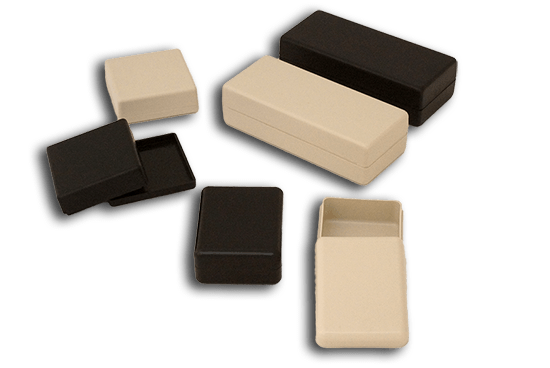 They are prefect for small electronic plastic project boxes. These IP65 plastic enclosures are made from high quality ABS plastic.